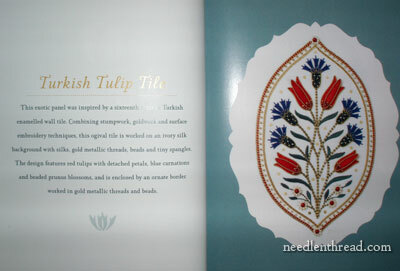 Stumpwork & Goldwork Embroidery Inspired by Turkish, Syrian & Persian Tiles by Jane Nicholas finally arrived! And I’m pretty darned excited to show you this beautiful book! Pretty, eh? I just love endpapers. Stumpwork Tiles is definitely a project book. 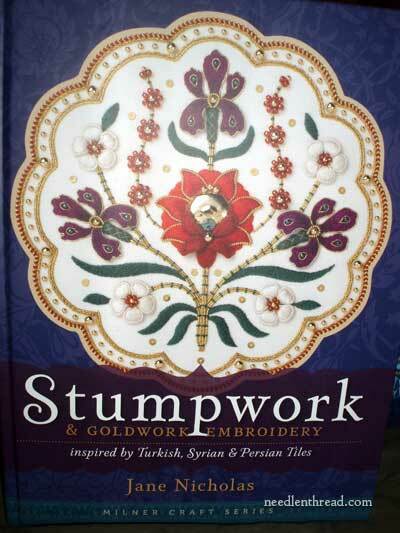 That is, if you are already somewhat familiar with stumpwork & goldwork and you’re looking for some exciting projects, this is a great book for that! 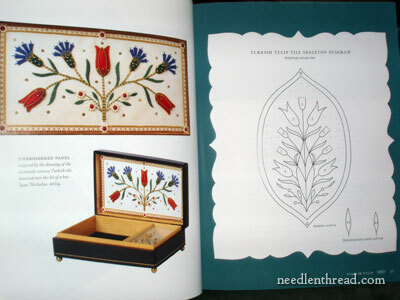 There are 16 projects in the book, featuring a combination of stumwork, goldwork, and beads. The book is a hard-cover tome, and it isn’t a little book. It’s just short of an inch thick, and checks in at 271 pages. 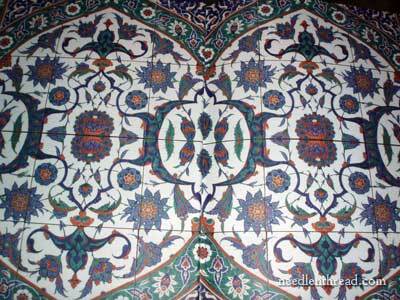 The author launches straight into the projects, which she has divided into four categories: Turkish tulip tile designs, Persian peony tile designs, Syrian pomegranate tile designs, and Islamic miscellaneous designs. Each project begins with a title page and a photo of the finished project. The design is supplied as a line drawing, to be traced or photocopied at the size given (there’s one exception, I think, for piece that has to be enlarged on the photocopier). Along with the various instructions, there are pictures peppering the whole book – pictures of variations on the designs in the book, little close up photos of different elements of the designs, and so forth. The book, in short, is very colorful. Following the line drawing, you’ll find a thorough list of supplies for the entire project. The supply list is followed by a breakdown of the project into its various sections, which correspond with the order of stitching. Each section begins again with a supply list just for that section of the project, and then continues with step-by-step written instructions on stitching the project. 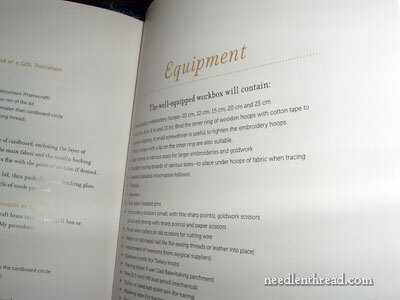 This is not a technique book – the instructions for stitching assume that there is some understanding of basic stitchery and of stumpwork. 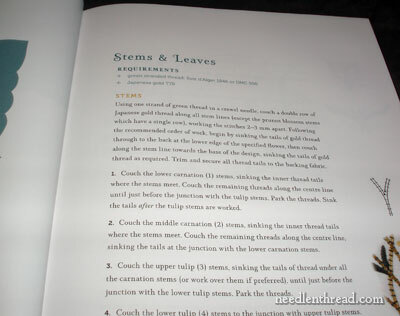 You won’t find step-by-step photos of each element in a project being stitched. Rather, the instructions are written out, and occasionally they are clarified by small line drawings in the margins. 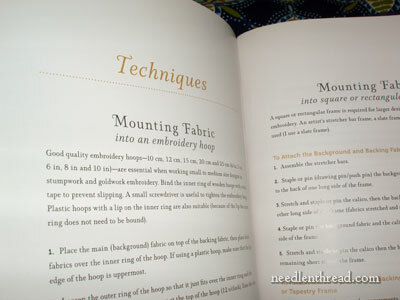 Following the projects, there is a section titled “Techniques” that covers everything from mounting your ground fabric in an embroidery hoop to placing mounting your finished piece in a glass paperweight. 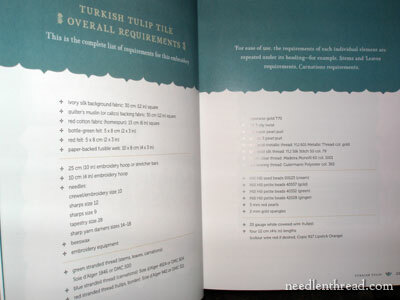 There are all kinds of hints in here that can be applied to all kinds of embroidery projects. I really like the page on equipment, which covers what should be in a well-equipped work basket. 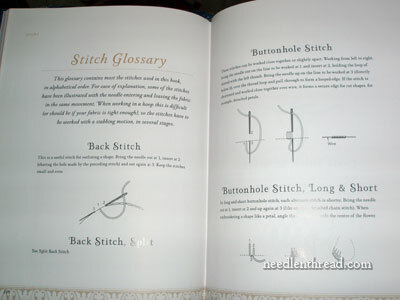 Finally, at the end of the book, there’s a stitch dictionary that covers all the stitches used in the various projects. My favorite aspect of the book is, of course, the various projects. They’re so rich and colorful. But within the projects, what I like best of all is the variety of edge treatments. I love the way Jane Nicholas combines different goldwork threads, colored flosses, and beads to make those gorgeous edges on each project! Another thing I like is the fact that there is a range of projects, from smaller, simpler designs to the larger more complex designs. If you’re a beginner who has never done stumpwork or goldwork, this might not be the book to start with, unless you’re one of those really enthused beginners with a basic knowledge of stitchery. If you’re into goldwork and stumpwork, and you like the look of these designs (if you love vibrant, rich colors and the sparkle of gold! ), then chances are, you’ll love this book! You can find kits to go along with the projects in the book at Jane Nicholas’s website. If you browse through her list of kits that go along with this particular book, you’ll get a good idea of all the projects in the book, too, so it’s worth stopping by her site for a visit! In the US, Stumpwork Tiles is available here, through Amazon. Worldwide, with free shipping, you’ll find Stumpwork Tiles here through Book Depository. Mary, I was drooling over this book and the kits when you first brought it to our attention. This one is going straight to the top of my wish list. Thank you for the lovely review. While the layout of her projects may be a bit too geometric and formal for my taste, the detail of the various elements are downright fabulous! Wow! I think even not-so-advanced stitchers would get lots of ideas to spice up simpler projects! My eyes are twinkling and my brain is abuzz. Time to go stitching! Thanks for showing us all these beauties!! so beautiful. you say that it would not be of much help to a beginner (other than for inspiration) is there a book you could recommend for a complete newbie? My dream is to take a class from Jane someday. I LOVE Stumpwork and she is the queen! She frequently teaches at EGA national seminars. In fact, she is teaching right now in San Francisco and is scheduled to teach in Naples, Florida in 2011 at the national seminar. Her classes always go to lottery. I have almost all her books and it is a treat to just sit back with a cup of coffee and page through them and dream. Mmmmmmm…I adore her beautiful work and long to learn from this Stumpwork master. Even-Star, I am a complete and utter beginner. The first real embroidery I tackled was a stumpwork nametag with elements out of Jane’s Complete Book of Stumpwork Embroidery. I was, as Mary called it, an enthusiastic beginner. I was willing to puzzle through the directions, and in fact, is how I landed here on Mary’s site, looking for some video on a few stitches that I couldn’t figure out on my own. I’m 40 this year. Prior to this, I learned how to needlepoint when I was 12, so it’s been a LONG time. In hindsight, I did a fairly good job of figuring out her directions, I just miscalculated on the sizing. Jane’s sewing is very tiny, and I sewed the things like the raspberries and the strawberries closer to real life size. I was really surprised to see her design in person and find out that it was about a 1/3 of that size. Jane’s class was listed as Beginner through Intermediate. 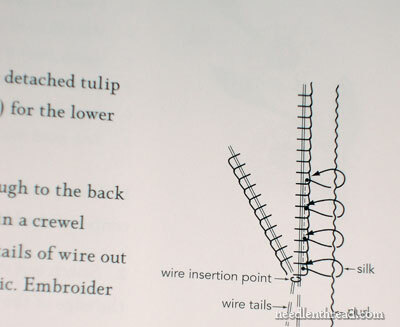 When she started talking about Buttonhole stitch, I nearly panicked, but she talked everyone through the directions. She’s very clear. She moves at a good pace, and gives you hand’s on experience with each element, to make sure you’re comfortable with it, before moving on. I’d say we learned 1 or 2 new techniques every hour, in the course of a 6 hour class. Without going back and counting how many things we practiced, we learned at least 6 and maybe more. We didn’t necessarily finish all of the bits that we worked on, but we walked out with enough knowledge and practice to complete it at home, comfortably. She’s a genuinely inspiring teacher who wants you to feel good about what you are learning, so I wasn’t as intimidated as I expected to feel in the presence of someone who is so amazingly accomplished as a designer and who shows such mastery of execution. She keeps the classes small so that she will get a chance to check on everyone’s progress frequently. She is delightful and I loved her class. I get the feeling that everyone who takes her class ends up feeling that way. Connie, I hope you will get into her class. It was a bit of a stretch to go to Seminar, but I will say it was totally and completely worth every cent. If you are considering trying stumpwork out, the Complete book is a great solid beginner’s manual, you’ll just need to get into a rhythm of going back and forth between a few sections, because it’s organized a bit like an index. A few sticky notes helped out so that I could flip back and forth between the sections I needed between directions and the color plates. I highly recommend it to start. I suspect that between Mary’s recent Goldwork lessons and Jane’s new book, and boy they did a nice job on the printing of it!, you can figure out the new projects as well. Hi Mary – What an absolutely beautiful book! It has inspired me to finish a stumpwork dragonfly I started…umm….many years ago! Living in Belgium, I just ordered the book on Amazon.eu and it will cost … 26 euros (mail costs included) compared to 70 euros (AUD equivalent in EUR) PLUS the shipping cost – giving a total of 115 EUR (the book is heavy) if it comes straight from Australia ! Perhaps it is worthwhile telling people from Europe to do as I did ? On the other hand, for the kits, it is impossible to order outside Jane’s site and there, the shipping costs are much lighter (about 11 AUD for a kit. So the best thing to do for Europe is to get the book on Amazon and the kits on Jane’s site. I Ordered the book today and I will receive it on Monday or Tuesday ! what a service ! This comment will hopefully be seen by Connie Fudge who wrote earlier in this list. Jane Nicholas is a regular at Koala Conventions, in fact her two latest books were initially launched at our Brisbane events. Connie you may be interested to hear; that Jane has been invited be with us in 2013 when we bring our team of Australian tutors to Seattle and Atlanta for 6 days teaching in each venue. Anyone can contact us for further details as they come available. Thank you for such a lovely review of the book. I love the projects they offer and all of the designs. Thank you for such a lovely review of the book. happr new year . can I give you my sisters address in florida ? thanks a lot dear mary . Gostaria de ganhar esse livro para a Minha escola de Bordados!!! Irá fazer parte da nossa Biblioteca de Bordados!! i would like more information about your beautiful embroidery.would like to learn if possible.email me plz. I just got this book and it is beautiful! I partially bought it because of your review. Just looking at the cover made me curious, but knowing the contents (via your review) helped me to decide it was worth having. Previous Previous post: Blackwork Fish Fin-ished.